IISER Bhopal Non-Teaching Recruitment 2018-19 Notification is given on the authoritative page @ www.iiserb.ac.in by the recruitment board officials of Indian Institute of Science Education and Research, Bhopal. So, the wiling candidates can apply for this IISER Bhopal Non-Teaching Jobs from 05th December 2018 to 05th January 2019 at the official page. 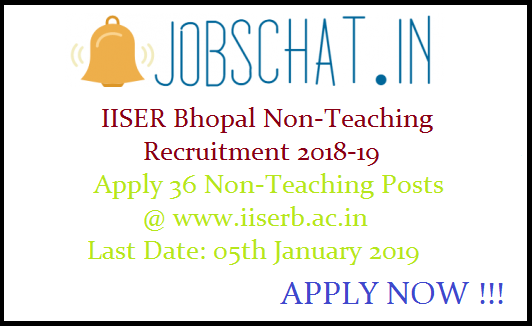 The aspirants who are interested in these IISER Bhopal Non-Teaching Posts that candidates can download this IISER Bhopal Non-Teaching Notification and check all terms and conditions from here on this page. Because on this page our team has uploaded the direct official page links to send this IISER Bhopal Non-Teaching Application Form in an easy manner. The recruitment board official of Indian Institute of Science Education and Research, Bhopal has released the IISER Bhopal Non-Teaching Recruitment 2018-19 Notification on the authoritative page to fill up the 36 vacancies of Non-Teaching (Assistant Registrar, Technical Officer, Scientific Officer, Medical Officer, Scientific Superintendent, Superintendent, Junior Engineer (Civil), Technical Assistant, LIA/ Technical Assistant, Office Assistant (MS), Technician, Pharmacist) Posts. So, the wiling candidates can download the IISER Bhopal Non-Teaching Notification and check all eligibility details from here on this page @ Jobschat.in and send their IISER Bhopal Non-Teaching Online Application Form to the official on before the last date 05th January 2019. Hello !!!!! Aspirants here is the great news for you that is the recruitment board of IISER Bhopal has going to hire the young and dynamic candidate to fill up these 36 IISER Bhopal Non-Teaching Posts. So, the aspirants who are interested in these jobs need to check this given below the table. Because on this table we have given the brief details of this IISER Bhopal Non-Teaching Recruitment and also give the direct official page links to apply along with IISER Bhopal Non-Teaching Online Application Form submission starting and ending dates. Here on this table, we have also updated the Latest Madhya Pradesh Govt Job Updates for the sake of applicants of this recruitment. Technical Officer B. E. / B. Tech or M. Sc. / MCA Degree in relevant field with first class or equivalent grade (6.5 in 10 point scale). Scientific Officer 1) M.Sc. in Biological Sciences in relevant field with first class or equivalent grade (6.5 in 10 point scale) and consistently excellent academic record. Scientific Superintendent (Biological Sciences & Chemistry) Master’s Degree in Science in relevant field with at least 55% marks or its equivalent grade. Superintendent Master’s Degree in any discipline with at least 50% marks or its equivalent grade. Junior Engineer (Civil) Bachelor’s Degree in (Civil) Engineering with at least 55% marks in the relevant field. Technical Assistant B.E. / B.Tech. / M.Sc./ MCA I M.Tech. (CS or IT with at least 55% marks in the appropriate field. OR B.Com. and M.Sc. / MCA / M. Tech. (CS or IT) with at least 55% marks in the appropriate field. LIA/ Technical Assistant Bachelor of Library & Information Science (BLISc.) with at least 60% marks or equivalent and M.C.A. / M.Sc. (CS or IT). Technician Bachelor’s Degree in Science / Technology / Engineering in relevant field with at least 55% marks. Pharmacist 1. Bachelor’s Degree (with 55%) in Pharmacy granted by an Institution of the Central/State Govt. 2. Should be registered as a ‘Pharmacist’ under the Pharmacy Act, 1948. The aspirants who are going to be applied for this IISER Bhopal Non-Teaching Recruitment 2018-19 must pay the application fee as per category wise. The candidates will be selected for this IISER Bhopal Non-Teaching Recruitment 2018-19 on the basis of Written test / Computer / Skill Test. The candidates who are going to be applied for this IISER Bhopal Non-Teaching 2018-19 Recruitment must and check all the eligibility details which are explained on this page. Here we have given the post wise educational qualification details along with experiences and also we have updated the age limits of the candidates for relevant posts. These all information is for the candidates who are not able to understand the official IISER Bhopal Non-Teaching Notification. So, the applicants can carefully read this article up to the end of this page to get the overall information regarding this IISER Bhopal Non-Teaching Recruitment. From here on this page aspirants also get the Results after completion of the recruitment process. The aspirants who have completed to read this all terms and conditions and who are satisfied with all these instructions which are give on this IISER Bhopal Non-Teaching Notification that candidates a log in to the official page by making use of this given below table links and start to filing the IISER Bhopal Non-Teaching Online Application Form with all valid information and send to the recruitment board on before the due date 05th January 2019. We hope that aspirants are getting all the details regarding this IISER Bhopal Non-Teaching Recruitment here on this page. Here aspirants will be selected for this recruitment on the basis of Experience or merit basis.